We think that a cutting/craft table should give back the floor area that it uses in storage space, don't you? For 20 square feet of floor space (44"x66"), you get back 55 cubic feet for storage of fabric, patterns, threads, notions, or other crafting supplies... and a very generous 44" x 66" cutting surface at a comfortable 36" working height. 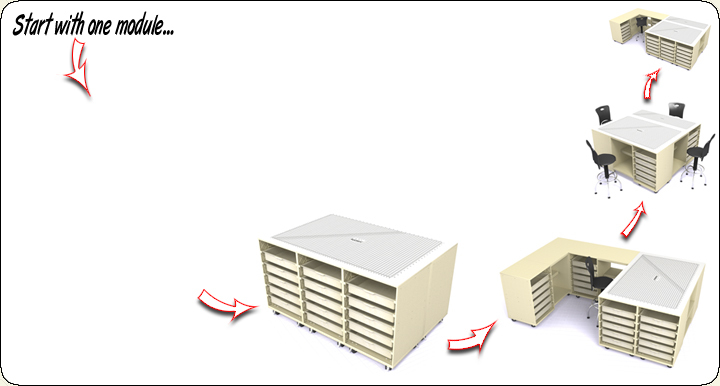 Each 22" x 22" structured resin molded module has 3" heavy-duty casters for true mobility. Join 6 units together to create the table shown below, or arrange fewer or more modules to suit your needs. Each module comes fully assembled and is easily attached to other units to create the work surface (and storage space) of your dreams. Now THAT'S a cutting table worth it's floor space! !